Children have followed me into my retirement. I used to love the child therapy part of my practice most of all and now that I’m no longer doing that I jump at opportunities to be around little ones. Lately, there seem to be a lot of them. In addition to showing them snakes and turtles and raptors I’ve also been teaching them how to felt. It might seem like sort of an esoteric art form for children but in my experience they take to it like ducks to water. The color, the texture, the slimy soap gel and water, the vague animal smell- well, they love it. Today was the third time in recent weeks that I’ve been in classrooms teaching and I wanted to show you what these third graders were able to achieve in 45 minutes. I usually start by showing them that great 3 minute video clip of Mongolian nomads making felt for a yurt; it’s a good one because it shows the process from sheep shearing to completion and it is also offers some historical perspective on the role of animal fiber in people’s lives. Then I pass around some raw stinky wool complete with bits of VM (this stands for vegetative matter, in wool fleece talk, and it usually involves a bit of manure, too and that is very titillating for 7 and 8 year olds) and work my way through letting them handle increasing refined wool, scoured, carded and dyed. They also love seeing silk worm cocoons and then the sheets of silk fiber (called silk hankies) that come from them. And then, we make felt! I let the kids do all of the layout and design on what will become a classroom reading rug and usually, they’re pretty good about adhering to instructions to lay it on lightly as opposed to flinging it on in clumps. Sometimes a couple of the boys who haven’t yet outgrown that frisky ADHD-like behavior get a bit carried away but today, these kids were great. I use an electric tea kettle to boil the water and we have a brief “stand back” phase while I sprinkle that on the wool and dribble on soap gel and then, as soon as it’s cool enough, it’s all hands on board. A gentle touch in the beginning stages can be challenging for small hands so I always cover the work with netting to hold it in place while the felting process begins. As soon as it starts holding together we roll it around a styrofoam pool noodle bound covered with a ridged mat and roll and roll and roll and look at these! Made by two different classes, back to back, in an hour and a half. I did bring them home to run them on gentle through the washer, getting all the soap and excess water out and Monday morning they’ll be back in the classroom for good. I ended each class by letting every child take a big handful of fleece home to play with on their own. In other news, my heart is in Asheville these past few days. Barack Obama is there today and it’s possible my new windows are, too, but I’m here ordering valve trim, valves, flanges, escutcheons, faucets, shower heads, toilets, sinks. I took on this end of the project to save some money and besides, plumbing comfort is important, if you know what I mean. Still, about the time I have 20 or 30 web pages open, comparing prices, I want to be there working the garden and watching the birds. Some people are discovering all sorts of winged wonders in their new home; I’m waiting to hang out more than the one feeder until I can be there to monitor the action. The last day I was there the USPS truck pulled up and left this special package. Do you remember when I wrote about my new friend who recently traveled down from North Carolina to take a felt jewelry class with me? About two years ago, right after moving into their home in the mountains, she and her husband both developed some serious health issues that necessitated a move closer to adult children and oncologists. 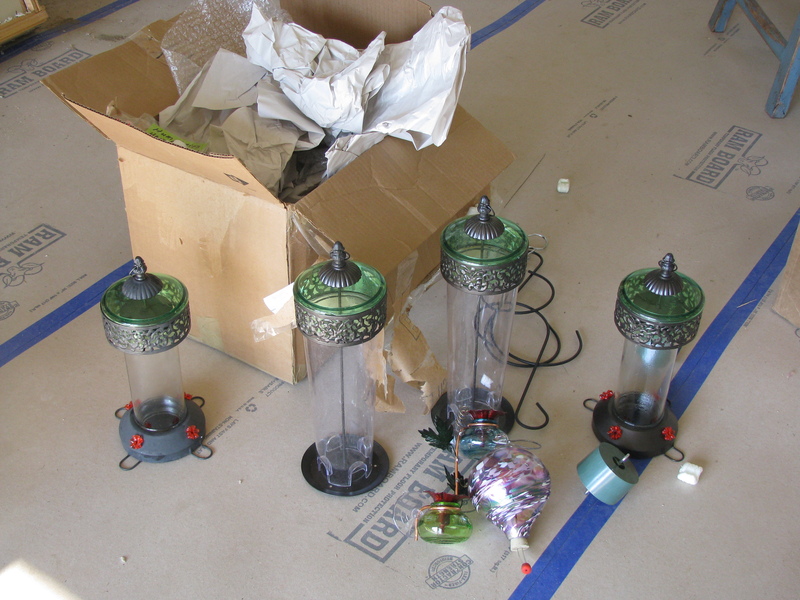 Now that they are in an apartment, she sent me her bird feeders. I was completely overwhelmed with her generosity and it was painful to leave them boxed up. Until the windows are up and the construction commotion over, it didn’t make sense to fill them, but I just can’t wait. And then I too will post pictures of hummingbirds! 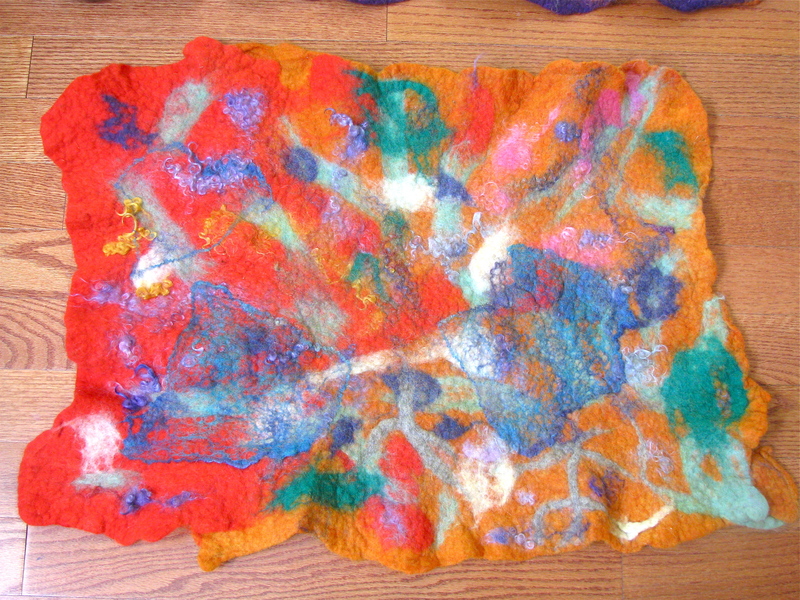 This entry was posted in Felting, Teaching wet felting to children. Bookmark the permalink. 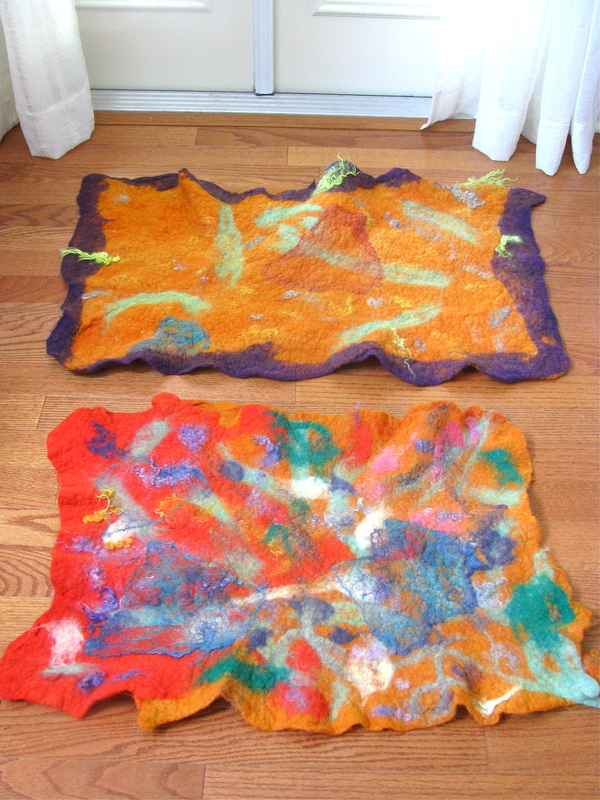 I absolutely love the felting they did – especially the purple and orange one!! 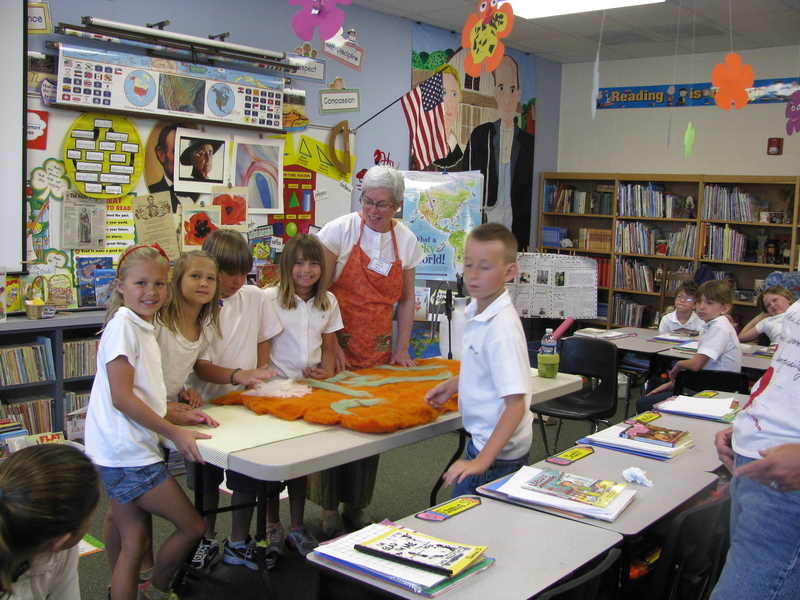 You must feel so blessed to be able to teach them something that may spark an interest in art that becomes life long! Those bird feeders are works of art too. 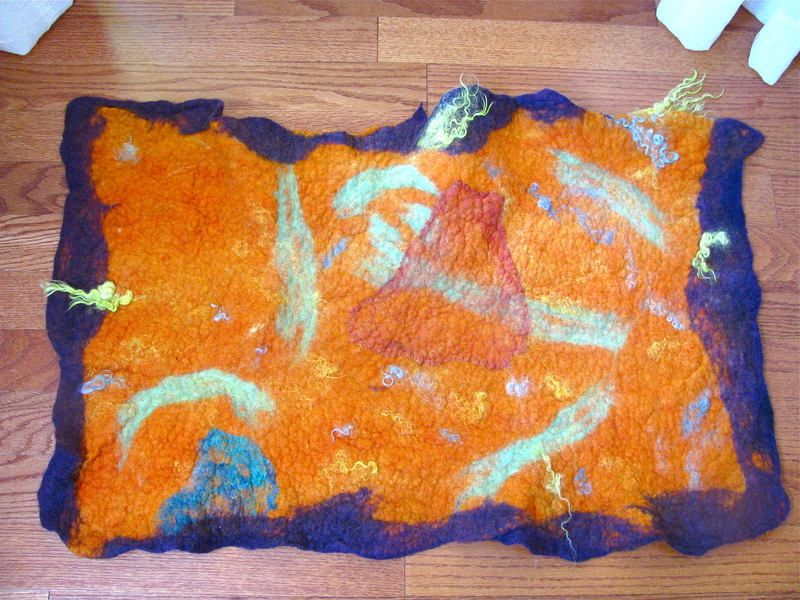 The felting is gorgeous… what wonders they are at that age. Sigh. I don’t know why I am really feeling the empty nest right about now…. You will not believe it, but I saw some of those tall ornate feeders and got one too. It is out and while they say the hummingbirds are back.. I haven’t seen one yet. My mocking bird got a taste of some BirdBerry Jam (I think it is just grape jelly) and he ate it up… now he is following me around the outside of the house with a menacing look. OK, OK I’ll put out some more… I had to clean out the garage before my trip…… yes, my little bit of OCD. So, if Nyssa ends up teaching at UNC Asheville… who might get to see your lovely garden…hint, hint. I too am drawn to the rug with the purple edge but both are so colorful and fun! What a sneaky, wonderful way to educate young children and allow them to have so much fun at the same time! My stick-on-the-window hummingbird feeder is a source of great entertainment and pleasure for Denny and I. It always amazes me how quickly the birds find it after we get set up at a campground; sometimes it’s within the first hour, sometimes it takes a day or two. But they always find it! Wow! This is extraordinary! This experience will stay with these children for a life time. 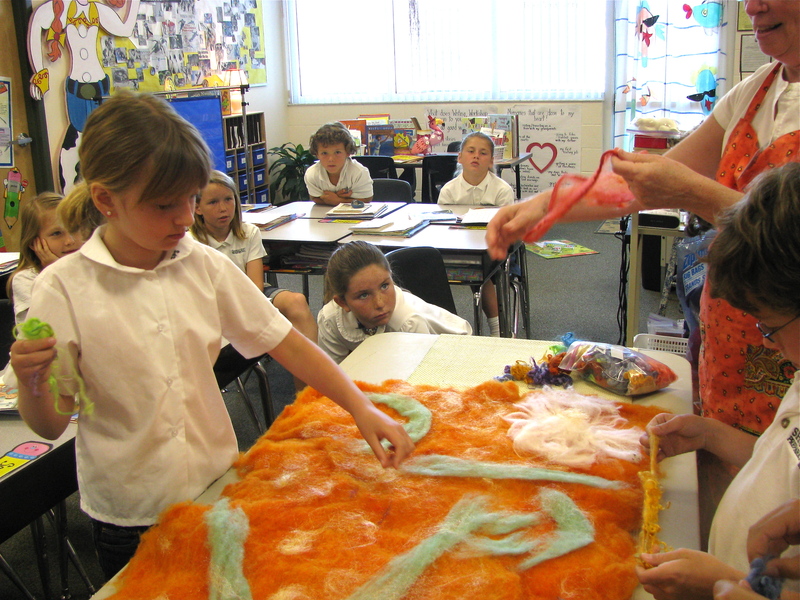 The are so blessed to have you show them how to do felting. I must say, I am just a tad bit over the edge of being a smidget jealous! Knowing that across the street and two houses down an Iraqi man has sheep gives me a feeling that soon I will be felting myself. Especially if you will send me directions of how to do it. Again, what a blessing for these children and for me to see and read about it! You leave good deeds where ever you go girl. Was that a private school classroom? I want to be in your class! Please? I’ll be good! How awesome, Vicki. You are an absolute rock star. They did such beautiful work. Lovely. So happy you are able to share this playful practice with them.